We are coming up on the largest Regional the Pokemon Trading Card Game has ever seen. If the actual attendance matches the registration, over 1000 Masters-division players will descend on Memphis, Tennesee, and only 32 of them - just over three percent - will advance to the second day of competition. 1. 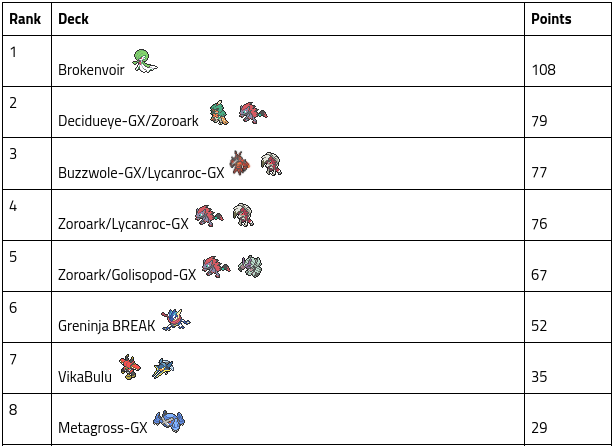 What if the Memphis metagame is close to the metagame from our 4-week Cup post-EUIC Cup sample? 2. 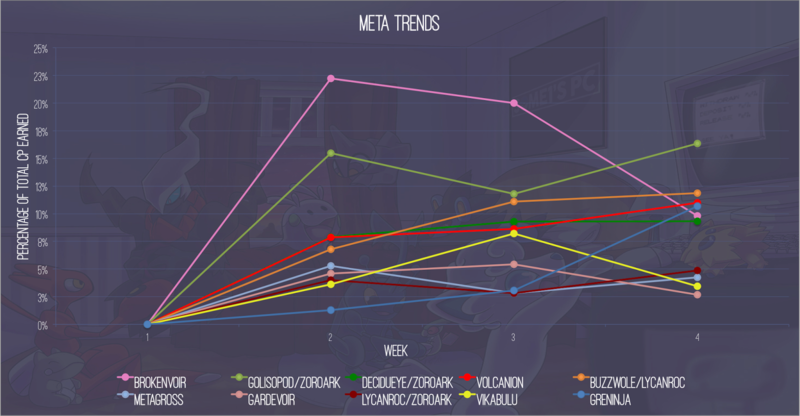 What if the Memphis metagame proceeds on trendlines from only the last week of our 4-week sample? - secondary question: what do these trendlines look like? Linear? Polynomial? Exponential? To elaborate a little further on these: the first option is to assume that the Memphis metagame will not change much from the metagame of PokéStats's 56-Cup sample. There is merit to this assumption. No new sets or promo cards have been released since the EUIC, and the decks seeing success at Cups have been almost entirely the same decks that did well at the EUIC. However, the second option involves looking at the sample not as one "block" of results, but as four individual weeks of data. This is best visualized with a line chart, which is what our Some1sPC Meta Snapshot does. With this model, we can examine the trends of each deck and try to extend their trendlines to see where they might end up for Memphis. To see what I mean about extrapolation being dangerous, take a look at the beginning of this Rainbow Road chart -- specifically the first four data points. The r-squared value, which can range from 0 to 1 and measures how well a linear model fits a set of points, is 0.9681 for those four events. This suggests that a linear model fits them almost perfectly. Yet if I extrapolated from that model when predicting the metagame of last season's EUIC, I would've predicted Rainbow Road to take 19.87% of the Day 2 metagame. My estimate would've been more than a five-fold increase over the actual Meta Share. Keeping all this in mind, I've decided to use both methods and come up with two different sets of predictions. First, I'll look at the four-week Cup sample as a whole, and, with the assumption that the Memphis metagame will be similar to that of the entire sample, predict the most-played decks at Memphis. 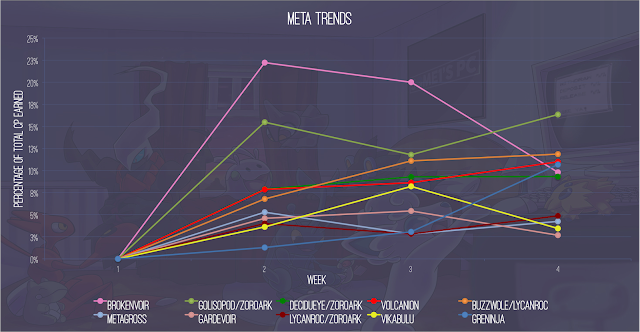 Then, I'll use the Some1sPC Meta Snapshot to predict how well each decks will do based on the trends observed over the sample. I'm making a slight leap of faith here: I'm equivalating CP Meta Share (as a percentage from the Cup sample) with Placement Meta Share (measuring the number of Day 2 spots a deck will earn in Memphis). For example, ZoroPod took 16.79% of the CP in the Cup sample, so I'm then projecting it to take 16.79 of the Day 2 Placements (not CP) in Memphis. I think in the future I'll actually do some math on this to see whether my assumption is statistically backed, but we'll try it for tonight and see what happens. Here are the decks I predict to make an appearance in Day 2 of Memphis. It does look like Zoroark decks of all varieties are taking over Standard. Both Lycanroc-GX and Decidueye-GX are formidable partners for it. This is also reflected in the final part of this article, which is our expert panel's Deck Power Rankings. Best of luck to everyone competing in Memphis tomorrow, and for everyone watching from home, stay tuned to @PokeStats_TCG and this site for the usual coverage!